Circulating Now welcomes guest blogger Dawn Hunter, Associate Professor, School of Visual Art and Design, University of South Carolina and Fulbright España Senior Research Fellow at the Instituto Cajal in Madrid, Spain. Her new body of work is a suite of biographical drawings and paintings about Santiago Ramón y Cajal, the father of modern neuroscience. Her series is comprised of creative works and formal investigations of Cajal’s scientific drawings that are currently on display at an exhibition at the John Porter Neuroscience Research Center at the National Institute of Health, Bethesda, MD. Some have said that when Alice falls down the rabbit hole, the tunnel is a symbolic aperture that allows her to examine her mind’s contents. One is reminded of Alice’s leap when standing at the top of the Instituto Cajal’s centrally located spiral staircase. Any voyager on that staircase is betwixt the micro and macro worlds. Walking down one descends into the microscopic workings of the brain and historical legacy of Santiago Ramón y Cajal while Cajal’s telescope, “gazes” up fixed upon the expanse lurking beyond the institute’s skylight. The correlation of Alice’s imaginary journey into the psyche’s otherness to Cajal’s real inquest of the mind is apt. Alice Pleasance Liddell, the inspiration for Lewis Carol’s “Alice,” and Santiago Ramón y Cajal were strangers but lived parallel lives in like surreal adventures of intramural worlds. Born just days apart in 1852, Santiago on May 1st and Alice on May 3rd, each was linked to unique polar expeditions of the élan vital until they died within a month of each other in 1934. Santiago passed away on October 17 and Alice died on November 16. Their lifetimes were spent juxtaposed within fantasy and materiality respectively: Alice, chaperoned by Lewis Carol, embarks into a nonsensical narration of an invented self. As captain of his microscope, Cajal set out to explore neuroanatomy through conjectures upon facts. Cajal revealed that nerve cells were unique and independent cells but linked together at points of functional contact (synapses). The Neuron Doctrine, the seminal written work of modern neuroscience, maintains his findings: the limbic system is composed of distinct singular cells that can perform individual or collaborative functions. He illustrated the results of his research by depicting the physiology of birds. These neuroanatomy drawings appeared in the premier edition of the Revista Trimestral de Histología Normal y Patológica (May 1888). As a histologist Cajal used drawing to discover, describe and understand neuroanatomy. Likewise, I have for the past few years been using drawing to explore, discern and explain Cajal. This form of research is a significant component in my creative, biographical project Aesthetic Instincts: the Intersection of Art and Science in the life of Santiago Ramón y Cajal. As a Fulbright Scholar during the fall of 2017, I spent every day exploring the historical archives of the Legado de Cajal at the Instituto Cajal, Madrid, Spain. 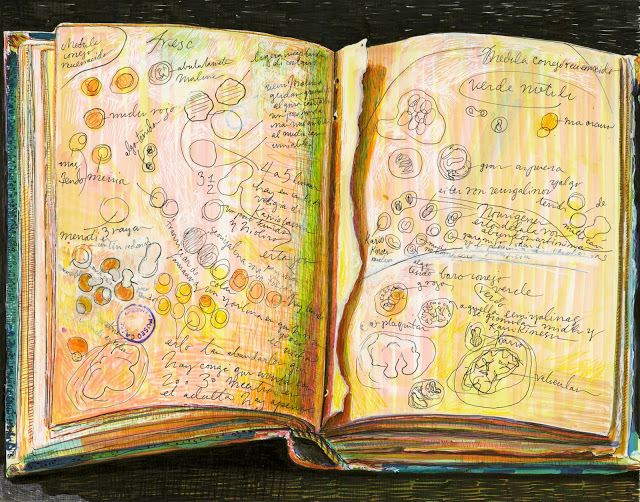 Through that process, I re-created many of his drawings and with a specific focus on replicating the pages of his first histology sketchbook. What can one discover about Cajal, beyond visual aesthetics, through the task of drawing? Through drawing, one can engage in “active looking” which is another level of perceptual involvement. How and who we are with and in our work matters. It determines how we conceptualize, realize, understand and share. Toni Morrison wrote in The Bluest Eye: “Love is never any better than the lover. Wicked people love wickedly, violent people love violently, weak people love weakly, stupid people love stupidly…” Line qualities within a pictorial composition are behaviors that have ideographic subtext. When retraced, they reveal the content of the maker’s reasoning and ideology beyond technique. The eye always seeks quality in the perceptually drawn line. The line’s merit invariably betrays the artist through the sight of the other. Study someone’s drawings, and you can study some of their components as a person, value system as a maker, or at a minimum the underground agenda with their work. On the pages of Cajal’s histology sketchbook, it appears as if his imagination is synchronized with popular concepts in 19th century Fantastique literature. Strewn with jottings and drawings examining the inner workings of rabbits, mice, cows and pigs, his sketchbook, like Alice’s world has no real order: it is upside down and backward, there are different points of time in departures, varied research themes, inconsistent goals, plus blank and missing pages. 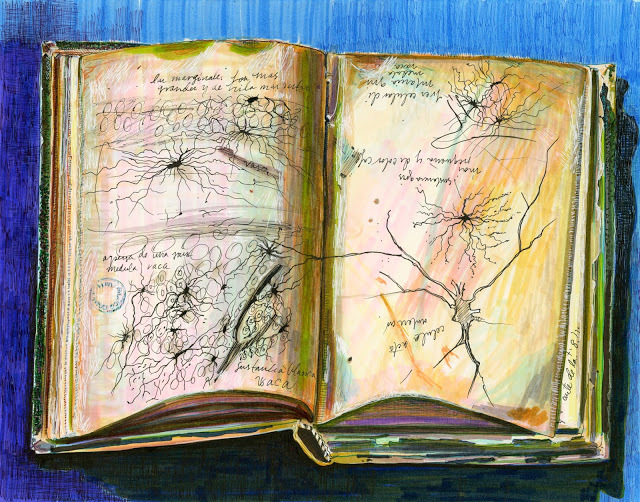 Alice metaphorically falls down the rabbit hole; however Cajal’s sketchbook is the rabbit hole. On the page marked “medula conejo recuernacido” (rabbit marrow remembered), he enters the matrix with unquestioning, commanding lines while sketching the cells of a “fresco” rabbit all the while taunting himself with a “Cheshire” like face hidden in a cell with the words “absolutemente maligno” (absolutely malicious) written beside it. This cellular Easter egg was a delicious discovery I made one day while recreating that page. I, and others, had looked at the page previously, but the process of active looking through drawing refined my observation in a manner that allowed me to notice this blast from the past and share a private giggle with Cajal. Cajal’s drawings are perceptual works, extracted neuroanatomy and within that real extracted context, function as linear abstractions of the original totality of the body. We live in a time where there is a lot of agreement as to how good perceptual drawings are made—at least in the academy: direct observation to hone drafting and sighting skills. A perceptual drawing reveals its history when you view it because perceptual drawing relies on change during its construction. The illustration depicts its subject through the summary of succeeding marks that make their appearance in the rendering at different points in time as the artist articulates, erases, and re-articulates the observed. Three years ago, when I saw one of Cajal’s drawings for the first time in an exhibition at the National Institute of Health, I drew his work out of an inspirational impulse. I was awed by the integrity of contours, and the elegant refinement of his lines in his neuroanatomy drawing. I felt astonishment with how the polished drawing I picked to recreate was put together—with a continuous, progressive, and accurate ink line for each unique form. I did not observe any pencil marks, nor did his hand take any breaks or resting points in the contour lines. Everything I “knew” about how to put a perceptual drawing together was thoroughly challenged. In those moments I knew this about Cajal: His approach to drawing revealed a fierce, strict, exquisite and serene personal intensity. Just like Alice, I was curious. 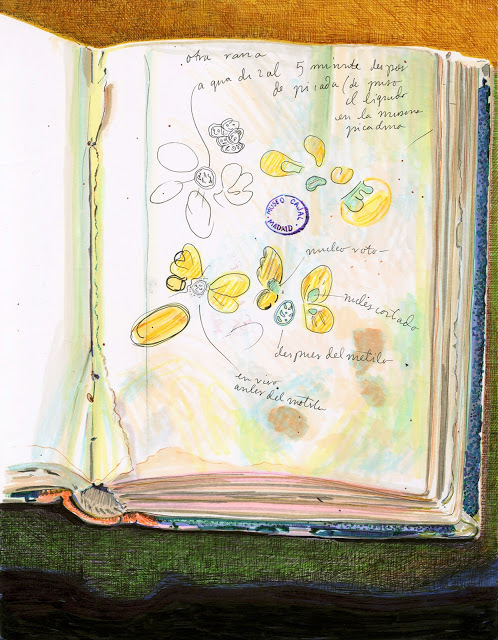 I arrived at the Instituto Cajal on the Fulbright España Senior Research Fellowship with a progressive agenda of items I wanted to look at, and his sketchbook topped my list. A sketchbook courts un-guardedness. I felt it would reveal what behaviors were most likely to be repeated in later works: if Cajal had consistent elements of erasing and redrawing in his sketchbook, that would indicate someone who would likely always sketch the underlying structure of a drawing prior to inking it. His sketchbook is composed primarily of vehemently confident lines in pencil, with some ink and some color with crayon and watercolor. He does not erase or re-draw his lines. The only times when his lines demonstrate hesitation or confusion are on the pages where he drew neurons for the first time. Then, as he moved the pencil and pen across the page, the lines change speed or abruptly shift and end. Behaviorally, in the sketchbook, that is unusual for Cajal. I have surmised that the inconsistency is because of an incorrect expectation on his part: he thought from the onset that those lines would interconnect or meet. In my opinion, based on the indecisiveness of that sketch, Cajal suspected that the nervous system was not a diffuse network the first time he drew neurons. The sketchbook reveals impulsiveness. Many pages are torn from it, and the remnants are folded and creased in such a manner that it evokes a mental image of a fist full of paper passionately ripped from the spine. Other gaps are irregularly cut, negative space rectangles. Perhaps the lacuna of drawings, like the Calyces of Held, edited out of the sketchbook and assembled in other publications? Beyond his sketchbook I examined a variety of his drawings. What I have learned is when he is trying to demonstrate how something truly exists within “life” he draws a precise, continuous line of ink while viewing his subject through the microscope. He does this without sketching the neurons on the page in pencil first. It is evident to me that his lines were determined from direct observation because of how the lines taper at the ends. A camera lucida traced line ends bluntly. The lead up to creating these exemplary perceptual works was the production of many of preliminary, separate sketches of the subject prior to the final execution. Cajal did use the camera lucida for his first major publication, Die Retina. The tiering design layout of the drawn figures are superior, however, comparably Cajal’s line quality in those works is manneristic and mechanical. When Cajal wanted to describe a theory, like the impulse pathways of neurons, he designed his ideas thoroughly with pencil and guidelines before inking the final work. The first time I drew Cajal’s work, it was a conversation, and one in which he spoke clearly through “the noble and enigmatic cell of thought.” He taught me a lot that day, changing how I think about him and approach my artistic work—forever. Cajal drew (sometimes) straight up with a continuous ink line for each form, so now when drawing his work, and making work about him, I do it, too. No pencil, no erasing. Except instead of replicating the process some of the time, I do it all of the time. I consider it a gift of communion from Cajal, and I think he would be pleased to be considered my art instructor. Read an earlier post about Dawn Hunter’s work related to Santiago Ramón y Cajal.